The Ducks’ 42-20 loss to the Ohio State Buckeyes in the College Football Playoff National Championship game had many people shaking their heads in disbelief. It seemed Oregon was finally positioned to claim its first college football national championship. The Ducks had everything a championship team needs to win: a dedicated and innovative coaching staff, a Heisman winning quarterback, a solid running game, a smart and powerful offensive line, and an aggressive defense. Oregon could not stop OSU’s Ezekiel Elliot. But ultimately, Oregon lost the battle in the trenches, allowing the Buckeyes’ running back Ezekiel Elliot to have a career day, rushing for 246 yards on 36 carries and four touchdowns. Oregon’s Thomas Tyner and Royce Freeman were held to just 132 yards rushing and zero rushing touchdowns. The Mighty Ducks that bullied teams throughout the season didn’t execute their game plan when it mattered most; even Marcus Mariota struggled to capitalize on turnovers and finish in the red zone. But there is nothing wrong with the Oregon football program, head coach Mark Helfrich, his staff, or the players that won Pac-12 Championship and the Rose Bowl. Despite the loss, this football program is still on the rise. Ohio State’s dominating performance over Oregon has resurfaced the unfortunate and inaccurate ”finesse” label, a negative implication that for the Ducks, speed and brute strength are mutually exclusive; either you’re fast or you’re strong, but not both. Former Oregon head coach Chip Kelly liked physically dominating offensive linemen. Oregon’s perceived sophistication comes from a simple mantra — repetition, preparation and practice to the point of perfection. 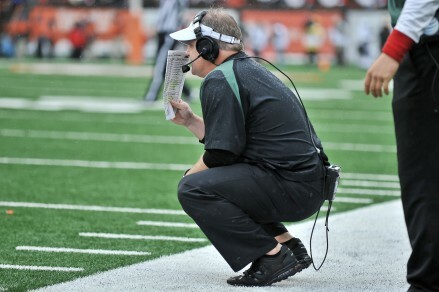 Chip Kelly, former Oregon head coach, best explained what he was implementing at Oregon at the Nike Coaches Clinic Presentation in 2009 (later printed in 2009 Coach of the Year Clinics Football Manual by D. Mark Robertson). At the time, offensive line coach Steve Greatwood developed an offensive line under Kelly that was one of the best in the business, helping Oregon lead the nation in scoring and total offense. The battle is won in the trenches. It takes a strong, physical offensive line to create running lanes, pushing defenders in a direction against their will, and to create and maintain a secure pocket for the quarterback. When Oregon gets beat physically, it’s not necessarily a matter of a lack of strength. It’s often an issue of technique. Earlier this season, the Ducks’ offensive line was being hammered by Arizona, stifling Mariota and disrupting the offense. 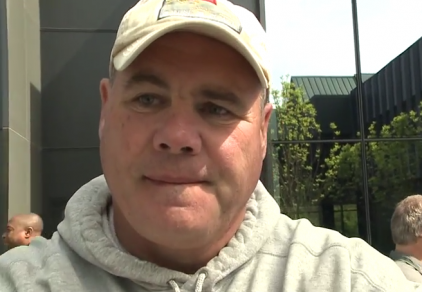 Oregon offensive line coach Steve Greatwood continues to develop strong, physical linemen. “After the Arizona game, I had to look at myself first and see what I was doing. We (the linemen) weren’t getting beat by mental mistakes. We were getting beat physically because of fundamentals,” Greatwood said. Oregon fixed those errors and beat the same Arizona team in the Pac-12 Championship game, demonstrating that executing the physical fundamentals the right way is the key to success. Maybe Ohio State was just more physical than Oregon, and all the fundamentals and techniques in the world couldn’t have stopped the Buckeyes on Jan. 12. But Oregon has shown it knows how to take an honest look in the mirror, examine weaknesses, and make the necessary adjustments in order to improve and keep rising. And a program that is willing to adapt is always a winning program.